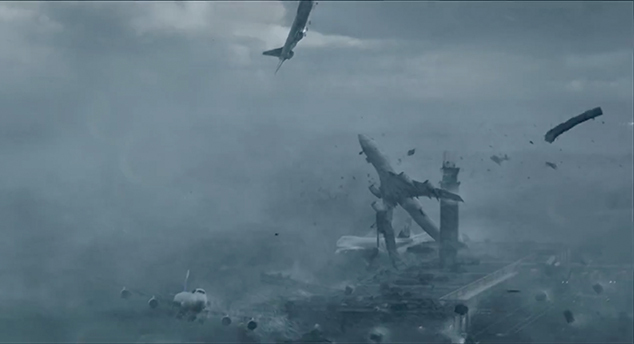 I can’t say I’m a fan of the devastation disaster movies visit on cinemas goers; 2012, The Day After Tomorrow and maybe Independence Day and Daylight come to mind and no, I have not seen Twister so I won’t be making any clichéd comparisons. Into the Storm seems to be the latest entry into what may pass as obsession with these forces of nature after the Sharknado films, which I haven’t seen and Metal Tornado which I unfortunately have. Into the storm will most likely remain a footnote in the annals of disaster cinema at best as Mark Kermode puts and it fails do anything except show us impressive CGI tornados and the preposterous image of an enormous tornado flinging jumbo jets through the sky and bear in mind this is in a small town so how they have an international standard airport, I do not know. This film also plays out as a found footage film or at least a quasi one but it fails to give us any substantive point of view as the utter destruction rampages around our characters in the small town of Silverton, Oklahoma. These characters include Gary Fuler (Richard Armitage) as a stern Vice Principal of the town’s high school, and his sons Donnie (Max Deacon) and Trey (Nathan Kress). We immediately realise there is the obligatory rift between the two sons and their father as Donnie, the older son, has grown apart from his father following the death of his mother and fathers wife and Trey on the other hand doesn’t think his father trusts him or gives him enough attention. These details you feel are rushed on us to give us some form of emotional stake before the storm hits. The boys are tasked by their dad to film the schools upcoming graduation ceremony but Donnie skips out to do a favour for his crush, Kaitlyn (Alycia Debnam Carey) as the storm approaches and we can figure out what happens next. The more interesting bits for me involve a group of storm chasers seeking the massive storms in a bid to experience the eye of the tornado. They are led by Pete (Matt Walsh) who appears to be veteran of storm chasing and the inventor of the TITUS, an impressive tank-like vehicle equipped with state of the art camera equipment and dual drill anchors that they hope will hold firm in the eye of a storm. He is joined by Allison (Sarah Wayne) a researcher tracking storms for him and 3 others who serve as camera crew for him as they strive for what would be ground breaking footage and research. Pete tracks the massive storm with a suicidal intent and his obsession is questioned by his Allison and his crew. We are meant to see the world from the array of cameras ranging from CCTV to regular digital cameras to IPhones but oddly enough all the cameras at different times feel the same and we never really get the sense of some rawness and grit surrounding the camera especially considering most of the action is in the backdrop of a frightening storm. The camera work also feels too polished like everyone recording had a director of photography credit on IMDB and frankly took away from the experience. There is a news crew in a chopper reporting as the storm develops but there is not a hint of urgency in their voice as we witness destruction of somewhat epic proportions in this small town setting. There is something in there about how we approach these terrifying natural phenomena’s with not dread but some near morbid curiosity in this information and social media age but our director Stephen Quale and writer, John Swetnam, do not pursue that. Honestly they don’t seem to commit to anything be it the father sons dynamic or the found footage or the storm chasing crew or even the storm itself and its destruction which you would have hoped would have been filmed with some dreadful reverence owing to the force of nature it is. Fits of terror gripped me for only a moment when the storm hits the high school and students cower in a hallway aware their lives truly were in the hands of this storm which rages at them with a furious vengeance. It would be an insult to most of you if I told you to switch off before entering this film but it is the only way you stand a chance of surviving the ordeal of watching it. It is arguably more of an ordeal to the audience than the characters onscreen who are basically two dimensional depriving us of any form of emotional stake. The actors are given very little to work with and at times they even seem to run out of dialogue. One could commend the special effects which are spectacular, no doubt about that, and that really brings the tornado and its destructive force to life and that may be entertaining enough for some but ultimately the lack of relatable characters and shallow story telling keep it from being a satisfying cinema experience and a solid disaster movie or basically a solid movie period.